The External Controls feature allows you to extend Goverlan’s functionality by adding links to external programs within Goverlan’s interface. An External Control is a link to any program or script which accepts a command line argument string containing a machine name, a user name, or both. External Controls can be configured for users or for computers. Once created, the external control is accessible for every object within Goverlan by simply expanding the External Controls node. 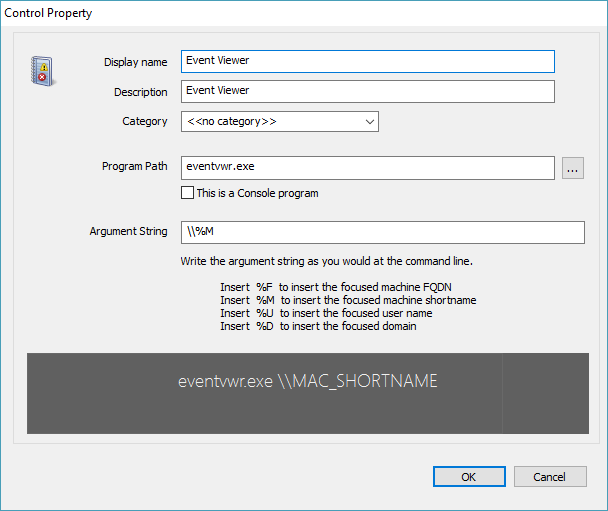 Goverlan comes with a set of default External Controls such as the Event Viewer and the Microsoft System Information. However, you can add as many controls as you want. Open the User object view to add a User-bound External Control or the Computer object view to add a Computer-bound External Control. Expand any object by double-clicking on it. Configure the external control properties.Let’s assume that you have a PowerShell script cmdlet: get-process which lists processes on a given computer. Enter the display name for this control. Specify the full path of the external program or script without the argument string. If the external program outputs information at the console, check the This is a Console program option. If the external program displays a user interface or has no output, remove this check. Enter the argument string for this control as you would when executing the application on a command line prompt. However, substitute any domain name, username, and machine name with %D, %U and %M, respectively. Review the Argument String Preview window to confirm that the resulting command line is as desired. Once all Goverlan Consoles have been pointed to the same Database, you can share your external control to make them available to other Goverlan users on your network.